Great lighting and excellent details, Tom. Excellent exposure on the snow. Outstanding work. first class Tom, what more can I say? 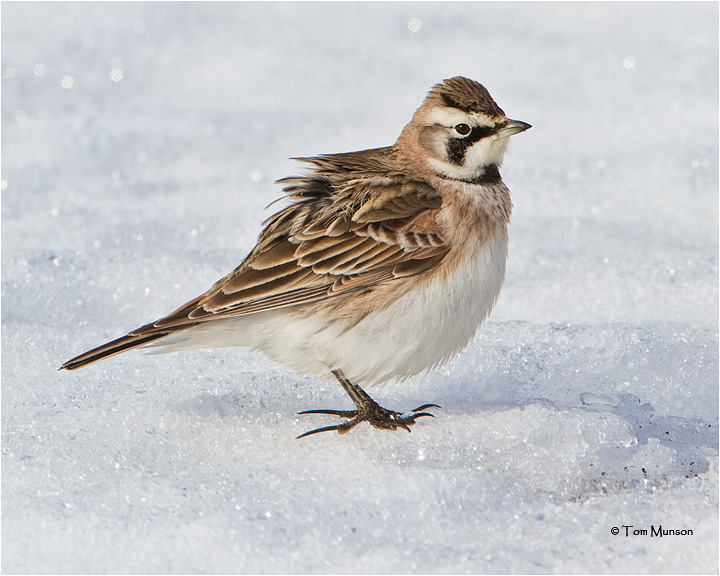 Great exposure of the brighness of the snow, nice sharp image a a very beautiful Horned Lark. Wonderful shot, great pose and very nicely exposed! V! Great setting and details, Tom... excellent! A beautiful little Lark. Excellent exposure and capture, Tom. What a sweet little beauty Tom! SUPER, well exposed image Tom. Great catch. Excellent details and pose. Very well done. Beautiful shot, Tom. I think it's amazing the detail we get like the the long posterior claws and the white edging on the feathers. Terrific capture of this beauty along with great detail, Tom! You really pulled the feather detail out on this one tom. Excellent capture. Nice capture, Tom. Good job on the exposure. Excellent exposure work and the plumage details are outstanding!